Over 7 billion people live on the Earth, and all those people need food, clean water and shelter to survive. Through daily living, though, people don’t always take good care of the Earth. 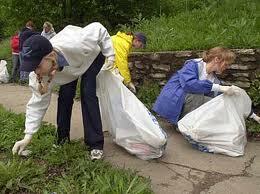 Did you know that most American families send 100 pounds of trash to landfills every week? That’s about 3 pounds of trash per person per day! 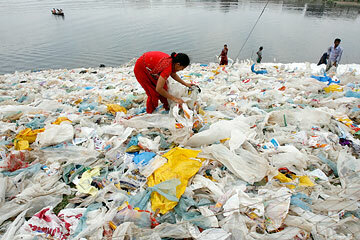 Americans use 102 billion plastic bags every year. These bags fill landfills and don’t break down. Caring for our world is needed because over 7 billion people live on the Earth, and all those people need food, clean water and shelter to survive. Trash fills landfills and makes an ugly mess. As it breaks down into smaller pieces, it can release poisonous chemicals that pollute our water and air. Factories also produce chemicals that are toxic. Fumes from our cars harm the atmosphere. Additionally, as people build more houses, buildings and factories, they cut down trees and destroy habitats for animals, sometimes causing them to become endangered or even extinct. 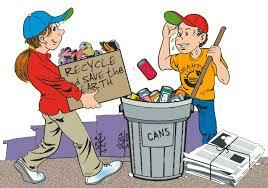 Talk with your parents about recycling. If your family isn’t recycling now, get going. Even a few simple changes can make a big difference. You can help. Compost your table scraps. You can add them to a backyard composter or even use a mini-composter that sits under your kitchen sink. Some people add red worms to a compost pile. The worms eat through the food and compost it even faster. Cool! Buy cloth bags and use them instead of plastic bags for groceries. Use cloth bags instead of Plastic bags. Americans use 102 billion plastic bags every year. These bags fill landfills and don’t break down. Buy the smallest car you need. Better yet, buy a hybrid or electric car that uses a lot less gas. Pick up trash when you see it. Be a good camper or hiker. Stay on the trails. Don’t pick plants or disturb animals. Caring for our world means picking up trash when you see it. An animated video about the cause and effect of air pollution. Question: What is Earth Day? Answer: Earth Day is a globally-recognized holiday that occurs on April 22. It was first celebrated in 1970. Question: Does recycling really make a difference? Answer: Absolutely. Recycling one ton of paper saves about 17 trees. If you recycle just one glass jar, you’ve saved enough energy to power a light bulb for four hours. 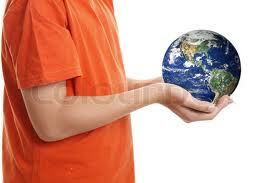 Enjoyed the Easy Science for Kids Website all about Caring for Our World info? Take the FREE & fun all about Caring for Our World quiz and download FREE all about Caring for Our World worksheet for kids. For lengthy info click here. Declan, Tobin. " Caring For Our World For Kids - ." Easy Science for Kids, Apr 2019. Web. 23 Apr 2019. < https://easyscienceforkids.com/all-about-caring-for-our-world/ >.